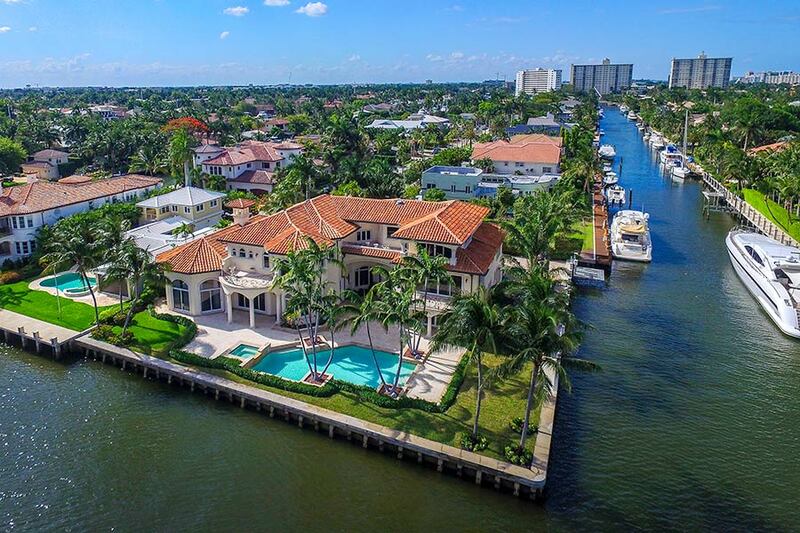 An impressive waterfront mansion in Fort Lauderdale, Florida that was originally built for Richard Yuengling of the D.G. Yuengling & Son beer empire will be sold at a live auction on June 30, 2016. Platinum Luxury Auctions, a veteran real estate auction firm headquartered in Miami, Florida, is managing the sale in cooperation with the property’s listing agent, Tim Elmes. Mr. Elmes and the Tim Elmes Group comprise a luxury sales team within the Fort Lauderdale office of Coldwell Banker Residential Real Estate. Although recently offered for sale at $10 million, the mansion will now be sold to the highest bidder who meets or exceeds a bid of only $4 million, which is the reserve price established for the luxury auction. Yuengling built the estate shortly after he acquired the property in 1999. Known as a “point lot,” the property occupies the southeastern portion, or “point,” of one of the streets in the Las Olas Isles, a collection of posh waterfront neighborhoods just east of downtown Fort Lauderdale. The estate offers 300 feet of deep-water boat dockage, consisting of 150 feet on the Intracaostal Waterway and 150 feet on a private canal, allowing for the accommodation of two yachts in excess of 120 feet each. Interestingly enough, the southeastern point of the isle to the east of Yuengling’s former home was once owned by another beer magnate. Adolphus Busch III, the former president and CEO of Anheuser-Busch and the grandson of the company’s founder, built a 12,000 sq. ft. vacation home there in 1938. Yuengling’s former mansion is presently owned by a retired pharmaceutical entrepreneur, who also owns several other properties in the South Florida area. He listed the property for sale after moving into a new home, but when the listing wasn’t producing the desired level of interest using traditional brokerage methods, the owner and Elmes hired Platinum to offer the mansion via luxury auction. The auction house specializes in the non-distressed sale of multi-million dollar properties within and outside of the United States, and it has completed more than $480 million in luxury real estate auction sales to date, all on behalf of wealthy homeowners. In addition to its water-frontage, the estate features a Mediterranean-inspired residence of nearly 11,800 square feet of interior space, with 6 bedrooms, 7 full and 2 half baths. There are two main living levels, in addition to a partial third level that offers a large entertainment space with a wet bar and waterfront terrace. Additional features of the home include a two-story foyer with a sweeping spiral staircase, primary and “junior” master suites, a gourmet kitchen, fitness center, “captain’s quarters” with convenient dock access, three bars, a 4-car garage, 2,000-bottle wine room, home theater, and a wood-paneled study. 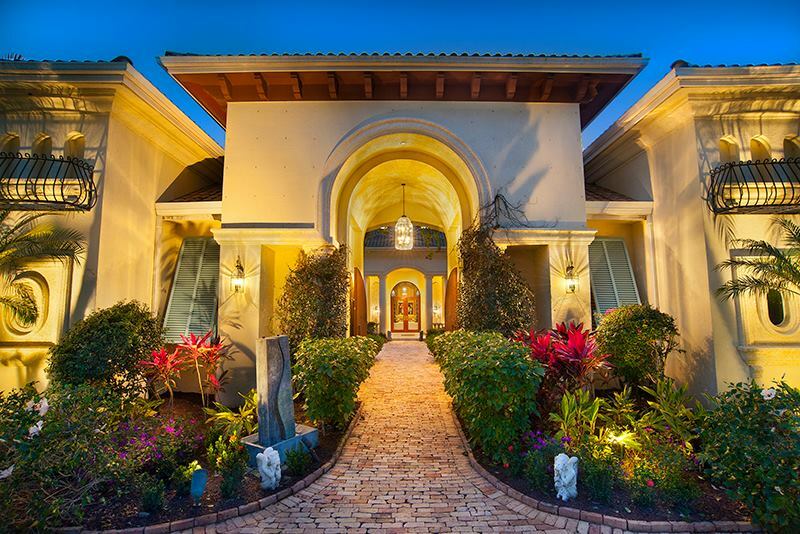 The grounds offer a gated entry, Chicago brick paver driveway, extensive landscaping with mature palms, and a vast outdoor living area situated on the waterway, complete with a custom pool and spa. The canal-side dock also contains a motorized lift for small watercraft such as jet skis. Property previews will be held every Thursday-Sunday between 12pm and 4pm, until the auction date. Interested parties may contact Platinum Luxury Auctions at 800.215.1457 or click here for additional details. Platinum Luxury Auctions has announced an upcoming, luxury real estate auction on the island of Kauai, Hawaii’s “Garden Isle.” Located in the community of Princeville on the island’s North Shore, the property was recently asking $9 million, but will now be sold to the highest bidder who meets or exceeds a bid of only $3 million at auction. In 2015, the home was awarded HGTV’s “Favorite Backyard Retreat,” as part of the popular television network’s Ultimate House Hunt contest. The live auction sale will be held at the property site on July 23rd. After a lengthy listing period with no viable offers, the property’s owners retained Platinum in order to achieve a more expeditious sale of the home. 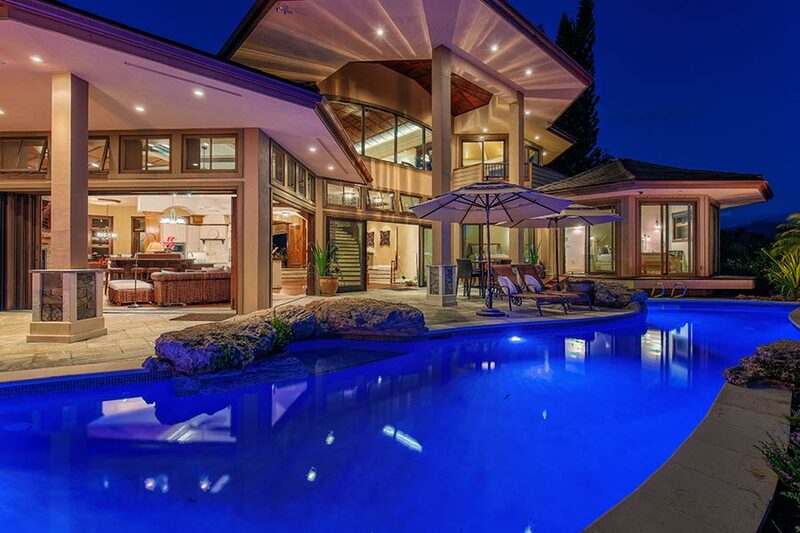 The auction marks Platinum’s first offering in Hawaii, and represents one of six high-priced property auctions the firm has scheduled for July and August, as it nears the $500 million mark in luxury real estate auction sales. Platinum is managing the sale in cooperation with Kauai’s leading real estate firm, Hawai’i Life Real Estate Brokers. Listing agents Ben Wellborn and Tiffany Spencer are representing Hawai’i Life in the transaction. The property sits on a pristine and secluded parcel of more than 1.5 acres in size. It’s elevated location allows for panoramic views of Kauai’s coveted Hanalei Bay, in addition to an awe-inspiring landscape of natural waterfalls, verdant mountains, sublime sunsets, and rather frequent rainbows. These views, combined with the property’s impressive main lanai – which includes a 50-foot saltwater pool and spa, a resort-style waterfall and grotto, multiple fire pits, and an outdoor kitchen – that earned the estate the HGTV award. Built in 2011, the property is comprised of a main residence and a separate guesthouse. In total, there is more than 5,700 square feet of living space, with 4 bedrooms, 4 full and 2 half baths, in addition to 2 outdoor showers. Interiors are luxurious yet relaxed, and feature materials that were sourced from around the world, including hand-hewn wooden flooring, Indonesian granite, Brazilian mahogany, and Italian stone. Additional amenities include state-of-the-art technology such as an indoor/outdoor wireless audio system, remote controlled sunshades, and Lutron “graphic eye” custom lighting. A beautiful Koi pond located within the main foyer, and a wall of sliding glass doors that open the interiors to the sprawling lanai, emphasize the residence’s harmony with its natural surroundings. As the oldest of the volcanic islands in the Hawaiian archipelago, Kauai earned its “Garden Isle” nickname due to the immense beauty of its emerald green landscapes. From the misty peaks of Kawaikini to the depths of Waimea Canyon, the 6 million-year-old island’s natural beauty can seem almost otherworldly. It’s for this reason that Kauai has served as a filming location for big budget Hollywood pictures that wish to capture the island’s exotic essence, such as the 1993 blockbuster Jurassic Park. Property previews begin June 27, and will be held daily from 12 to 4 p.m. HST, until auction day. Interested parties may contact Platinum Luxury Auctions at 800.262.5132 or visit HILuxuryAuction.com for additional details and downloadable materials. When Trayor Lesnock first saw the sleek, futuristic-looking, glass and steel structure floating just off the docks in Fort Lauderdale, Florida in 2008, he never thought that years later, his firm would be handling its sale. Originally built by the Lazzara Yachts company to serve as a state-of-the-art showcase and sales facility for its inventory of multimillion-dollar yachts, the structure – technically classified as a “scow barge” because while it is a watercraft, it is not self-propelled – was named Legacy, and debuted at the 2008 Fort Lauderdale International Boat Show. Legacy was such a head-turner that one yachting publication in attendance at the event penned an article christening it as that year’s “Belle of the Ball.” (Anyone who has been to a Boat Show in Fort Lauderdale and witnessed the amount and caliber of hyper-expensive boats and toys on display understands the significance of standing out from such a crowd). Platinum Luxury Auctions is preparing for the upcoming, June 13th luxury real estate auction of Rivendall, a beautiful, Mediterranean-style villa located on the island of St. John in the United States Virgin Islands (USVI). 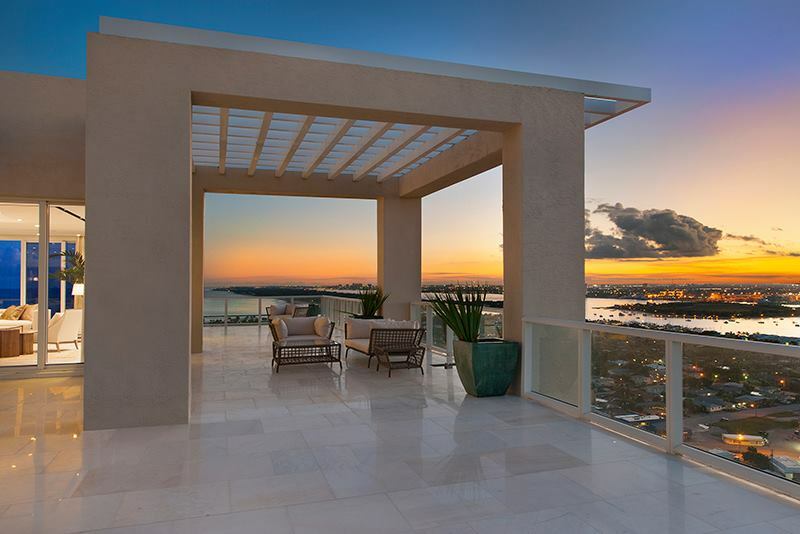 Our upcoming January 16th auction of the Signature Collection Penthouse at The Ritz-Carlton Residences on Singer Island has attracted much attention this month. Both the Palm Beach Post and ABC affiliate WPBF 25 News debuted pieces showcasing the many features and amenities the penthouse has to offer.